The Lands of Briddia were originally a single continent ruled over by a dragon called Beli Mawr (Beli the Great). It was said that he was a son of the gods Belenus and Belisama but that he had been born near to death. To save him, his parents used sacrificial dragons' blood to replenish his diminished life energies and understood full well there would be consequences. As a result, Beli Mawr inherited the dragons hatred for the violent act they had done to it and grew into a violent god the gods learned to fear. He would be sent into exile within Wyvernia so that he might find others of his kind and would not be alone. 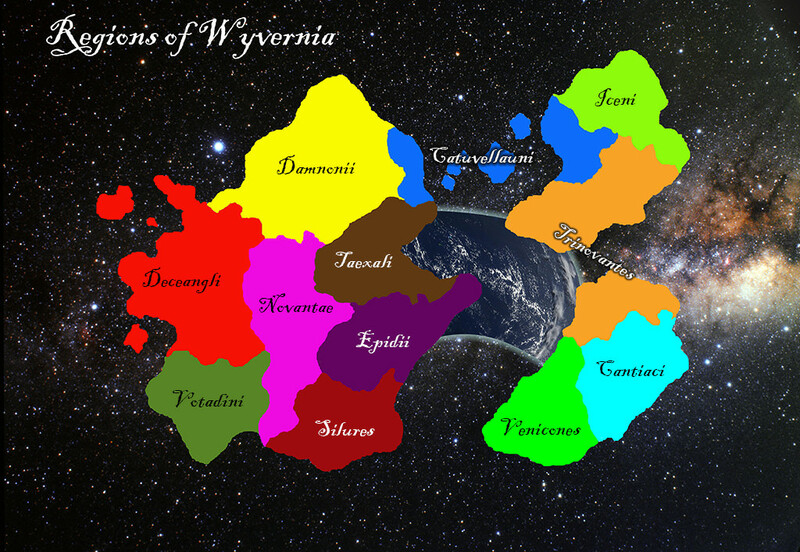 This was a realm ruled by dragons and Dyndreigiau (dragon men) with a great number of humans held subject to their rule. This would also be the birthplace of the Imperial House of Gwyn Nadredd (White Snakes) which would survive for two-centuries with Beli Mawr as its Lord Magistrate. It would be destroyed by Yr Ymerawdwr Ddraig Du (The Black Dragon Emperor) and the landmass upon which it rested would be fragmented into three smaller subcontinents with numerous "islands". Humans now seemed to pour through from the World of Men as if the doorway between worlds had been torn wide open. Beli Mawr, however, had suffered fatal injuries and retired to the Gwâl Y Ddraig Gwyn (Lair of the White Dragon) to die. There, he would be joined by a young fae sent by his parents to ease his suffering and to guard his burial place as sacred ground. Of the three new subcontinents, Tir Afonydd Du (Land of Black Rivers) is the largest with Tir Cathod Mawr (Land of Big Cats) and Tir y Gythreuliaid (Land of Demons) next in order. Tir Eira (Land of Snow) is the largest island and it is here where Beli Mawr went to die on what essentially has become a moon. Into this world then arrived a warrior-king named Cunobelinos (Strong as a Dog) with an army of bewildered men having no understanding how they had come to be there. The answer lay with a beautiful fae calling herself Lili Eira (Snow Lily) who was mysteriously in their company and who held close to Cunobelinos. She was the one responsible for these events as she was herself foreign to this world and the keeper of Beli Mawrs' bones. She had journeyed far to find Cunobelinos, meeting with his war leaders at a circle of stones known as the Kings Men, preparing for battle against a Roman invasion of Britain. Lili Eira would explain to him that the bleeding rose in her hands would take him to a new world even as this one was destined to be lost to him. He had responded that he would not be parted from his men and clasping her hands around his, a smile crossed Lili Eira's face as she told him he would not be separated and she gave him a kiss. When he released her from his embrace, Cunobelinos was to find that he was no longer on his own lands and demanded to know what she had done. She would respond that he would not be separated from his men and so, she brought them with him. Taking the power she needed to bring his men through the doorway between worlds from the doorway itself, there would be no returning. Cunobelinos was where fate had always meant him and as word spread about his triumphs against the Dyndreigiau, other humans became drawn to his leadership. These were men of exceptional fighting skills who would successfully refound the Kingdom of Catuvellauni and spread their conquests until controlling all the lands he called Briddia. 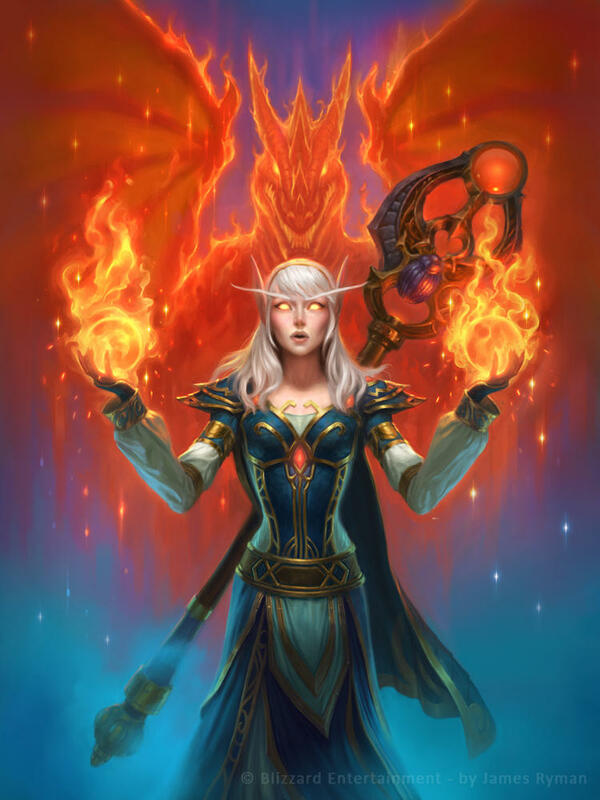 Lili Eira would take the name Y Frenhines Tatianna (Queen Tatianna), she had taken Cunobelinos to Tir Eira where he would find himself before the bones of a massive, and majestic, dragon to receive his ivory crown. Cunobelinos had been chosen as worthy to succeed Beli Mawr and to assume his identity along with his power. Even the dragons and Dyndreigiau of Briddia would now bow before him with his half-fae offspring either ruling kingdoms of their own, or holding high positions in their fathers' service. These children would mix their blood with humans who, in turn, mixed theirs with the Dyndreigiau creating a new race called the Dyndraig'firain (Fair Dragon Man). While the Imperial House was lost forever, there remained magick within its walls which Beli Mawr rekindled by rebuilding them. Taking the form of a massive wagon wheel called Y Olwyn Fawr (The Great Wheel), the Dyndraig'firain would build their civilization from ruins into a magnificent palacial fortification. Collapsing into a series of feudal kingdoms, Beli Mawr took on a more ceremonial role as Hymerodron (Emperor) and formed a new government. At the heart of Y Olwyn Fawr was the Isle of Welwyn upon which would be created a massive, overstated capital city-state. The new Imperial Commonwealth would give the Lesser Houses of Briddia a measure of self-rule creating a strong, centralized government. Mawreddog Gynulliad (Grand Assembly) would become the seat of this government and a new head of state called Sárkány was elected to govern it as the Uchel Canghellor (High Chancellor) who rules second only to Beli Mawr himself. The Sárkány resides in Llysoedd Canghellorion (Chancellors Hall) from which he controls the Commonwealth of Briddia..
Mawreddog Gynulliad is the actual meeting place for all representatives from the Lesser Houses to congregate to decide the rule of law. These Lesser Houses are the kingdoms of the lands and Mawreddog Gynulliad consists of three branches/divisions. First is Tŷ Ymerodrol yr Arglwyddi (Imperial House of Lords), which helps govern the kingdoms common interests. Next is Tŷ Ymerodrol yr Gomins (House of Commons) which is where common folk can have their say to the political structure of their lands where previously, they had no say at all in how they were governed. Lastly, there is the Llys y Gymanwlad, the Court of the Commonwealth representing administration of the legal system. The Sárkány is the military head of state as well with only the Hymerodron having greater power (when he chooses to exercise it). But the Grand Assembly possesses the authority to remove the Sárkány from power by majority rule which limits abuses of power. The Lesser Houses are so named because they represent the Assembly of the Commonwealth within each kingdom. It is from them that the representatives within the Grand Assembly are chosen and the Raglaw (Governor) from each Assembly is elected to become Sárkány. The Raglaw within each kingdom tends to be a member of the royal family, but the Sárkány is more often not because royals do not trust royals from other kingdoms. For as briefly as the Imperial House of Gwyn Nadredd existed, there emerged a legal organization whose enforcers became known as the Cyfreithwyr (Lawgivers) whose chief enforcers are more simply known as the Rhaith. They answer to the Atwrnai Cyffredinol who answered only to the Hymerodron and Sárkány before the Imperial House of Gwyn Nadredd was destroyed. When this event happened, the Rhaith existed throughout Wyvernia and had become enforcers of Imperial Law whomever was Lord Magistrate or where the Imperial House lay. The Rhaith of the Llys Ymerodrol, however, are subject to the Sárkány whose authority overrides that of the courts, the Tŷ Ymerodrol yr Arglwyddi and Tŷ Ymerodrol yr Gomins. Catuvellauni would remain the most powerful of the kingdoms, but it wasn't the largest even if it spanned two of the three subcontinents and the islands in-between. The largest of the lands isn't even visible to the eye as within every Imperial House exists an inner world much larger than its exterior walls. Each meets a different fate when their Imperial House is destroyed and, in the case of Briddia, it would survive unseen until Catuvellauni came into being. It was a land overrun by thorn-bearing, flowering vines and within which lay a hidden doorway into the Dark Universe where dwelled the "Dark God" Ysgithrog. Calling the land Draenog (Blackthorn), Beli Mawr became its self-appointed guardian against Ysgithrog and safeguarding the vast wealth that lay within. Four access points were located that surrounded Welwyn and all four of the small islands that contained them were encased is artificial stone. Known as the Moons of Draenog, these four objects keep surrounding regions bathed in perpetual light and are guarded by four powerful dragons protecting them against trespassers. The largest of the four moons lay above the void between Catuvellauni and is known as Lloer Serennu (Moon Star), followed by Dymestl (Storm), Chryman (Sickle) and Mhenglog (Skull). Beli Mawr can summon greater power by draining it from these moons to transform himself into Angou Draig (Death Dragon), one of the most powerful of dragons who was adopted by the gods Belenus and Belisama as their own. The bridges of Briddia are perhaps its most notable feature. Existing between the subcontinents and the islands which surround them, they serve almost as a neverending public works program. They are constantly being worked on by large groups of builders, repairing and extending as the islands float about with the larger bridges always in good working order. These are patrolled by Marchog (Knights) to protect travelers but the smaller bridges are normally patrolled by groups of retired military if patrolled at all. That being said, the gates to the bridges are heavily guarded and people's travels are documented to provide accurate figures of deaths and crime in the areas around them. The larger bridges are often constructed from iron and steel, where the smaller bridges are more often made from wood, stone and iron. The largest of all the bridges are built into Y Olwyn Fawr, the Great Wheel which lay between East and West Catuvellauni. It would be created from a multitude of building materials that included small islands upon which communities are built. To pay for all this, tolls are charged and taxes are taken from commerce providing for the needs of travelers. Construction work is big business on Briddia and the borders between each kingdom are controlled by walls through which trade, traffic and immigration are controlled. Because so many are employed in construction, Briddia is possibly the most advanced of the lands in Wyvernia with their services in high demand on the other continents. While advanced technology is as rare in the Worlds of Shadow as sorcery is in the World of Man, there are examples of it on Briddia. The Y Olwyn Fawr Railroad is one such example. Powered by steam, this basic technology exists and travels in both directions along the entire course of Y Olwyn Fawrs outer circle. This train, like many of the sky-ships, is steam-powered by basic mechanical processes. Sky-ships can navigate the airways and are the safest and quickest way to travel between the lands (provided you can afford the price of a seat or holding bay for your cargo). Trade by sky-ships allows Briddia to explore the furthest reaches of Wyvernia and are often escorted by Gŵr O' Rhyfel (Man of War) specifically designed for fighting dragons. The city-state of Welwyn itself is a splendour of architecture, with large parks within the city limits adding the touch of tranquillity to the busy markets and factories here. The largest and most ornate building in Welwyn is the House of Sárkány, which is constructed with a toe bone from the Great Beast Zomok himself and decorated in ivory, bronze, silver, and gold. The Kingdoms of Briddia are the Iceni, Catuvellauni, Trinovantes, Cantiaci, Dumnonii, Epidii, Silures, Wotadini, Deceangli, Novantae, Taexali and Venicones. Tribal Confederations (Tri-Cons) that exist within, and overlapping, the kingdoms include the Regnenses, Atrebates, Belgae, Durotriges, Corieltauvi and Dobunni to name but a few. Last edited by Armorbeast; November 5th, 2018 at 03:47 AM.